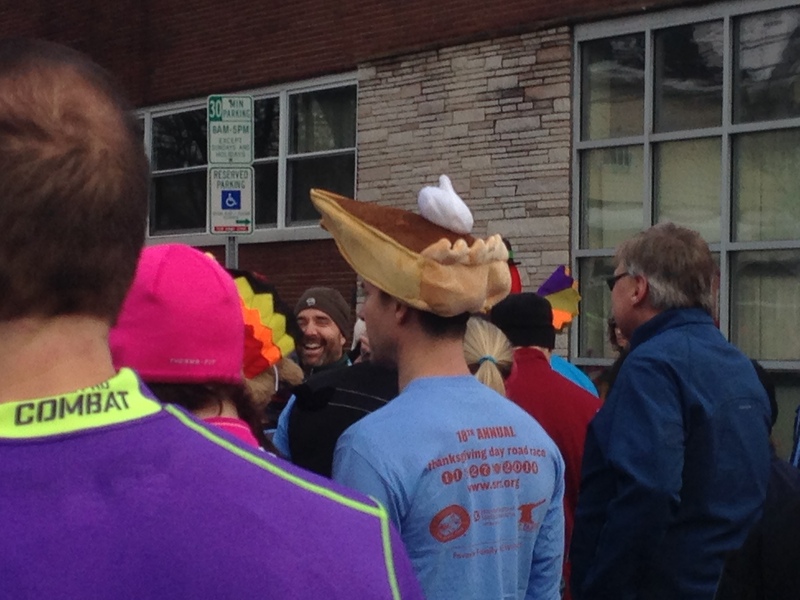 This race is a Thanksgiving tradition for me, and it is one of my favorite parts of going home for the holidays. I ran my first GGG Run in 2008, the year I started running, and I plan my Thanksgiving travel around it every year. Somerville is the city I grew up in, but I was never involved with the Somerville Road Runners because I didn’t start running (or exercising, like, at all) until years after I’d moved to New York. I love knowing that if I were ever to move back, there would be this awesome running community to be a part of right in my own backyard. This is the first year (2016) that I wont be running this race! I’m staying in New York with my 8 month old. Hopefully, I’ll be back next year! I hope everyone running has a lot of fun and wears wonderful costumes!! This race is not really for PRing although there are definitely people running for time, but they have to stand right at the start line because there is no starting mat. [I believe there is a starting mat now] There were a lot of strollers, which we probably could have avoided by starting further up in the pack as there are no corrals. My boyfriend and I passed about half a mile discussing stroller running etiquette. I definitely need to consult a stroller runner for their opinion on this (stay tuned). This race is not perfect, but I love it, and I’m clearly not the only one as it sells out every single year. The Turkey and the Pilgrim can be friends! Thanksgiving morning was beautiful and wintery (if you like wintery, which I do), with snow on the roofs and lawns, and it was warm enough to be comfortable waiting at the start. There were a lot of excellent Thanksgiving related (and some not related) costumes, as there are every year. We had a great 4 mile run around Somerville during which we passed at least four Dunkin Donuts. Then we went to the Dunkin Donuts at the finish line and got hot chocolate and walked the mile to my mom’s house to start cooking! 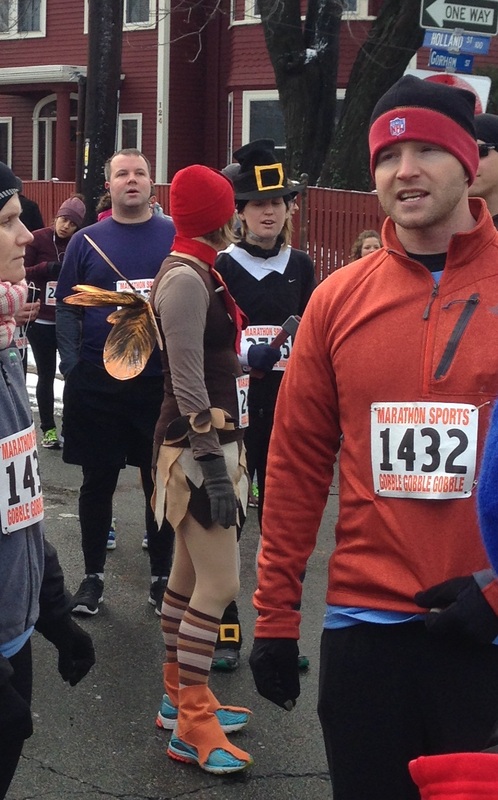 Race Organization: 3.5 – Excellent “gobble” arrows mark the course and there are a good number of volunteers dressed in turkey costumes. The only downside for folks who don’t live near by and take the T in is no bag watch. Level of Communication: 5 – I’d say perfect – just enough email to let you know how to pick up your bib and get to the race on time. The one thing I’d like is notification when registration opens because the race sells out every year. Race Course: 3 – Every year the race website describes this race as “mostly flat,” but I think they forgot the word “not” in there. You’ll notice that this isn’t true anymore. 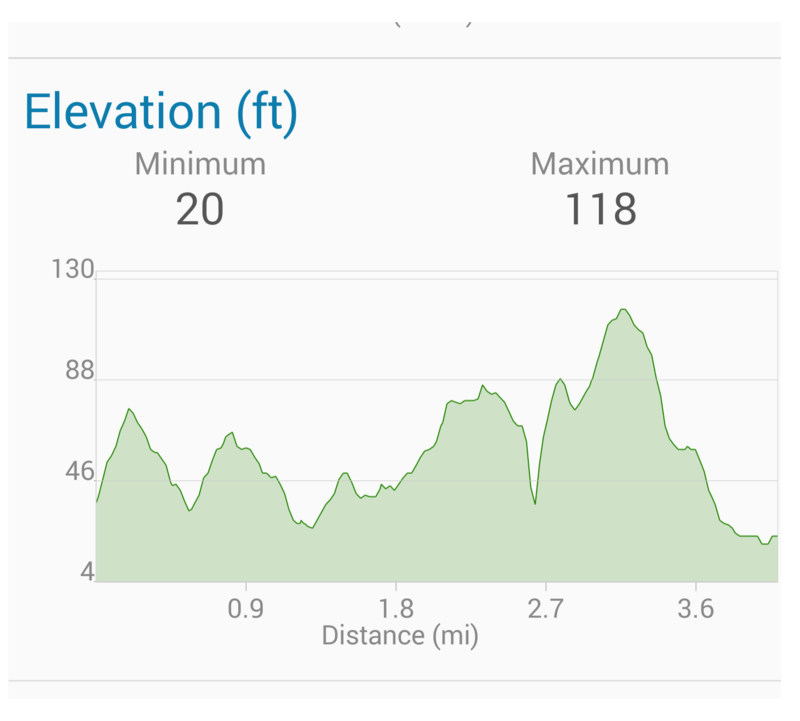 I see the race directors now admit to some “rolling hills.” The downhill at the end definitely makes all the work on those hills worthwhile! This year the course was a little crowded because I think it was the first time they only closed one side of the two-way streets. This was probably more annoying to the cars stuck in the middle of the race as the runners took over the other side of the street. One downside to the course is that there is no start mat- so your finish time is recorded but your start time is the gun time.Again, I think that there is a start mat now. Swag: 4 – There’s no real swag for this race other than the t-shirt, but I don’t really expect swag at a 4 miler. Marathon Sports, one of the race sponsors/ bib pick-up spot does offer a 20% discount to runners. T shirt: 4 – The shirt is pretty much the same each year just in different colors- long sleeved, cotton, “gobble, gobble, gobble” written across the front. I can’t believe I wont have a 2016 shirt! Medal: N/A – No medal. I don’t expect a medal at a 4 mile race so I’m not going to count this against them. Post Race Swag: 2 – No freebies, but after-party at the Burren if you’re up for a drink at 9am thanksgiving morning (and clearly some are as there’s always a line to get in). 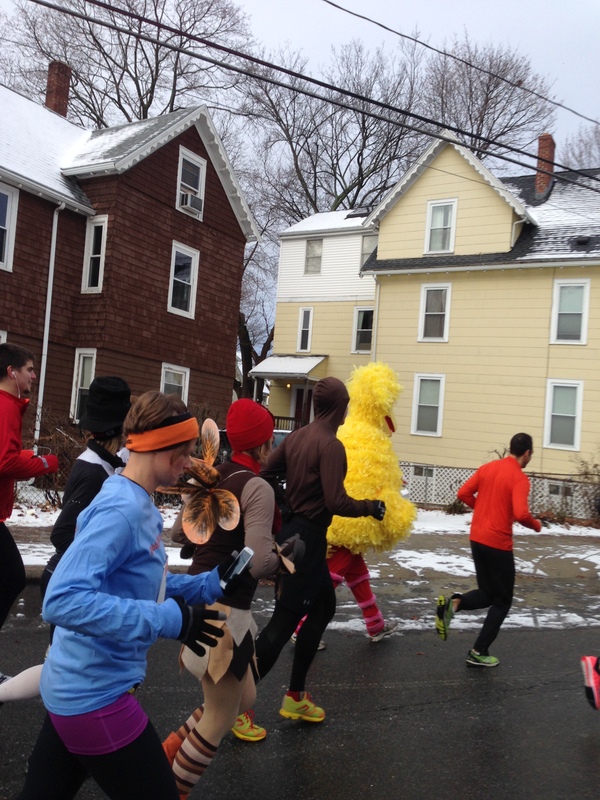 Spectator Support: 4.5 – Given that it’s a race on a cold, snowy Thanksgiving morning, the spectator scene was pretty good. It’s mostly folks out to cheer for family members, but they made some noise for all the runners.